I love banana bread. I have tried many, many variations. This one is definitely a top contender! 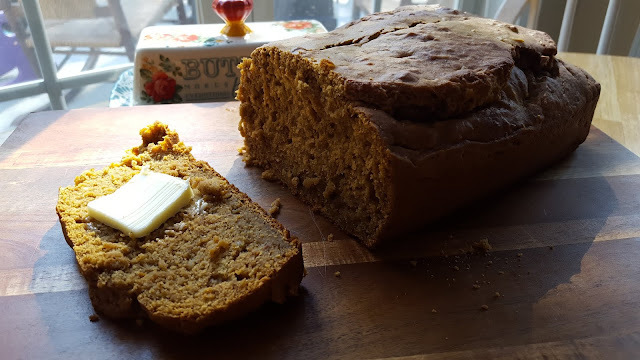 It has a wonderfully moist texture, and is packed full of pumpkin and banana - neither flavor is overpowering, you can just taste both. It is perfect warm from the oven with a little butter spread over the top. But it doesn't even need butter. My picky 5-year old really liked this one too, and has requested a second batch since the first disappeared much too quickly for her liking! 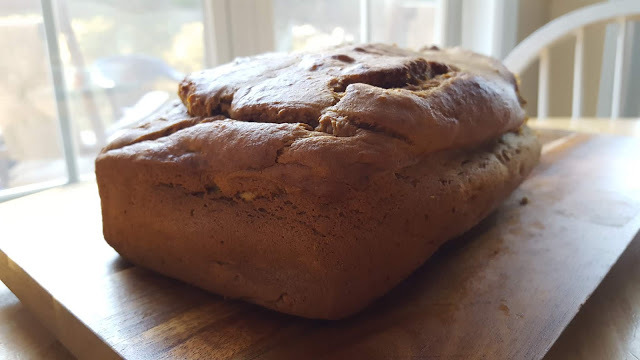 And who am I to complain about such a request - the smell during baking alone is totally worth the few minutes it takes to whip this recipe up! 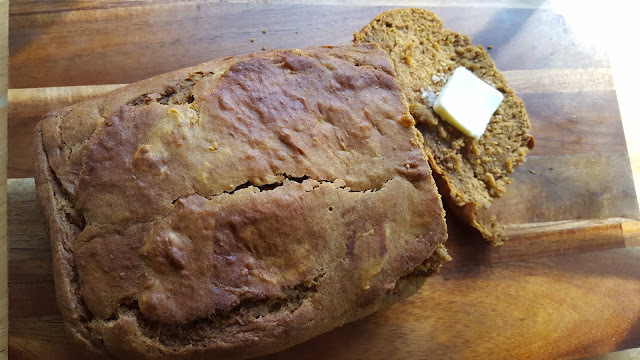 I think today might be another good day for a batch of this bread (I save over ripe bananas in a bag in the freezer for just such occasions), a cup of hot coffee, and the fireplace on. Sounds like a good way to end the day to me. Preheat oven to 350 degrees, and prep a loaf pan by spraying with non-stick cooking spray. Blend the bananas and pumpkin together on medium-low speed in the bowl of a stand mixer. When combined, add in the eggs one at a time (scrape down the sides as necessary) until well blended. Add in the oil and sugars, blending again until combined. In a separate bowl combine the flour, baking powder, baking soda, salt, and spices. Stir to mix well. Slowly and on low speed, add in the dry ingredients to the wet. When batter is evenly mixed, pour into the prepared loaf pan and smooth the top. Bake for 50-60 minutes, using a toothpick to test the center to ensure it is baked through. Cool 10 minutes in the pan before removing to a wire rack to cool completely.